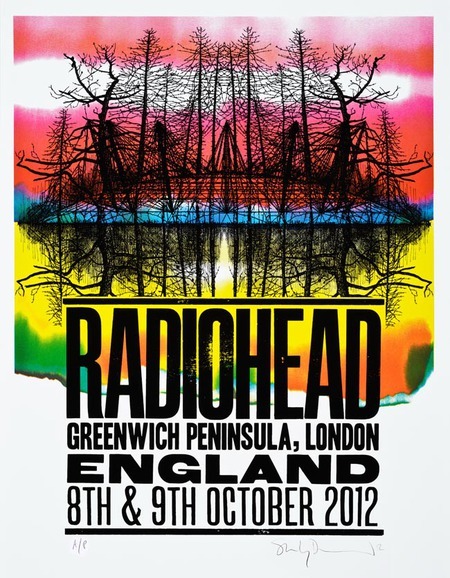 Intriguingly sinister yet irresistibly stunning are words that come to mind as you experience the Stanley Donwood exhibition at Ink_d Gallery, Brighton. The enigmatic artist, well known for creating Radiohead’s album and poster art, won a Grammy for ‘Best Boxed or Special Limited Edition Package’ for his direction on Radiohead’s ‘In Rainbows’ album. The much anticipated display of Donwood’s work follows from a successful exhibition of rare prints back in 2009. This time, his exhibition, named ‘Occupational Hazard’, features currently available work alongside rare and sold out editions such as ‘Twisted Woods’. As you walk into ‘Occupational Hazard’, the meaning of this title begins to sink in. You are faced with a glass panel in the floor revealing an underground studio and wedged precariously underneath the glass are the exhibition posters. At £10 it is the cheapest item on sale, and a piece of art in its own right. Combining elements of Donwood’s signature works it features the insane ‘Hungry Bear’ symbol used in various Radiohead albums, in front of the trees from his ‘Twisted Woods’ series. These tree silhouettes, combined with the merging rainbow colours, a significant theme in Donwood’s work, are reminiscent of ink blot tests, while the overall layout is based on Stanley’s latest Radiohead tour poster ‘Terrordome’. Donwood used the words ‘mild peril’ to describe the exhibition’s contents. This seemed to be in the form of a demonic goat’s head mounted on the wall with multi-coloured paints dripping down its face. A very striking piece is ‘Occupied Fortune’ which included an elaborately decorated background and in a circular cut-out were the words: “If a man has an apartment stacked to the ceiling with newspapers we call him crazy. If a woman has a trailer house full of cats we call her nuts. This clearly reflects Donwood’s desire to fuse personal and political emotions with modesty and humour. To see a £355 Glastonbury poster and an exclusive new series of signed giclée prints of album artwork which have never been printed, visit ‘Occupational Hazard’ at Ink_d, Brighton, which runs until December 2.